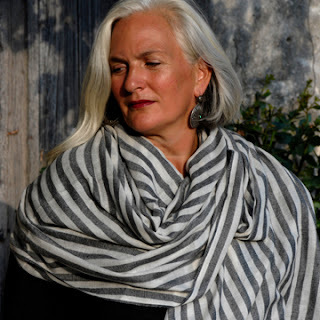 M. wrote to say, "Scarves aren't that frightening due to their manageable sizes, but shawls are another matter" and asked how to wear a large shawl, especially when working, driving a car, etc. 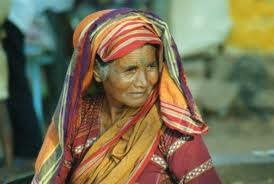 In India, you will see women engaged in every kind of task in shawls and saris, without a problem. The key is to adapt the shawl to your activity. 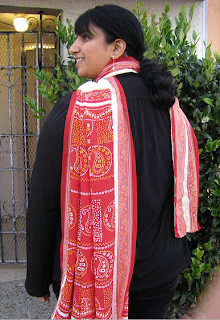 If you want your arms free, move the point to the centre front, so the shawl drapes like a giant bandanna. If you take the ends of the example above, cross them, wrap them around the neck and tie the ends in back, you'll have a generous muffler, good for a cool evening on a patio or boat. A soft, sensual alternative to jackets and easy travelers, shawls will always fit. Though I've long seen them in business-casual settings and of course for leisure, I recently saw a woman in a jade green pashmina with embroidered borders in a formal business setting. 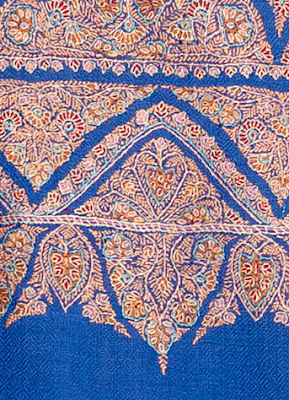 Hers was a treasure from the seller of exquisite shawls, Trehearne and Brar. Shown, a detail of one of their summer pieces in delphinium blue. So, thank you for asking, M. Just choose a size that doesn't overwhelm you, and enjoy. PS. 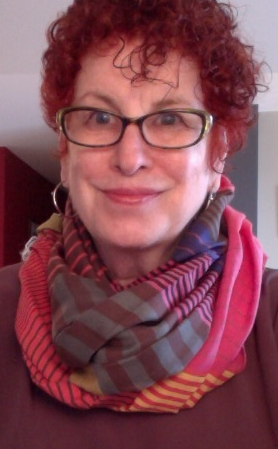 After writing, I found this terrific post, Wearing Scarves: Big Scarves, on the blog Aesthetic Alterations. Inspiring photos–and consistent advice to just 'toss them on'. Inspiring! Have a few shawls that I love and rarely wear but you've convinced me to take them out and play.I would think that a shawl of material that "grabs" would lend itself well to some of these arrangements and stay put a bit better? Thank you for this great post! 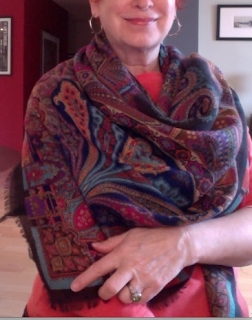 I love scarves and I'm going to India for my niece's wedding next month. This is a great refresher. 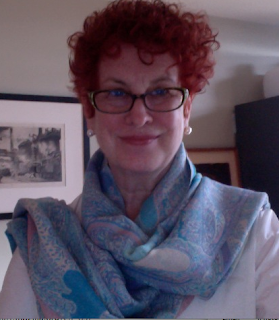 I can use lightweight scarves to turn my more western style summer outfits a little more "modest" while traveling in that great country. Cheers! Lovely post. 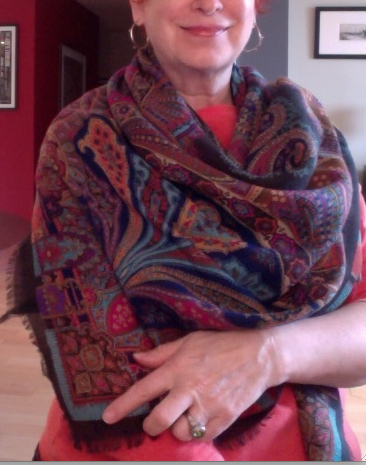 I find long scarves and shawls easy to manage and wear them a great deal. I am still finding my way with wearing the square version though. What gorgeous examples -- and fun to see you modelling your own. I picked up a shawl in Paris to wear with a sleeveless dress at my son's wedding later this summer. I'll be studying your photos carefully . . . Your shawls are glorious. I agree with Mater - how fun to see you modelling your own. Awesome! This is very helpful (though I may wait until the 100 degree temps and humidity break before I pull out wool). And now I need to check out those beautiful shawls at Devotion too.. Thank you - I can do this now! You look great modeling the shawls. 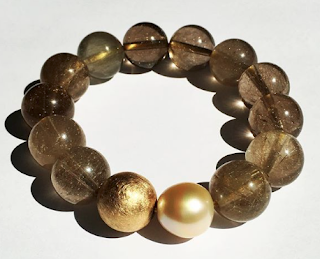 I like the variations that you have focused on and think they add a touch of glamour. perhaps there's a shawl in my future. pseu: I don't buy slippy shawls; slippy is fine in scarves but hell to wear as a shawl. Jessica: Yes, more modest and also useful for establishing some personal space in crowded cars or even on the street. Mardel: I prefer rectangles, much easier. materfamilias: Those are not good photos, just what I took sitting at my computer, but they do show the drapes. Will enjoy seeing your shawl. Artful: In highly ac'd rooms or in evening, fine wool can feel wonderful, but cotton or cotton, cotton/silk blends or linen are best in summer. Devotion have great pieces and very good service. 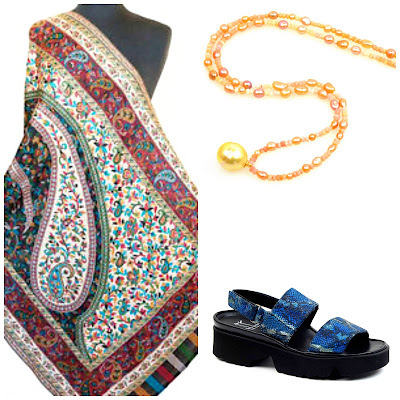 hostess: I prefer quite strict clothes, usually solids, so shawls extend my wardrobe and add interest. Thanks! Beautiful examples. I have several and wear them frequently. great for the office and the crazy air conditioning! 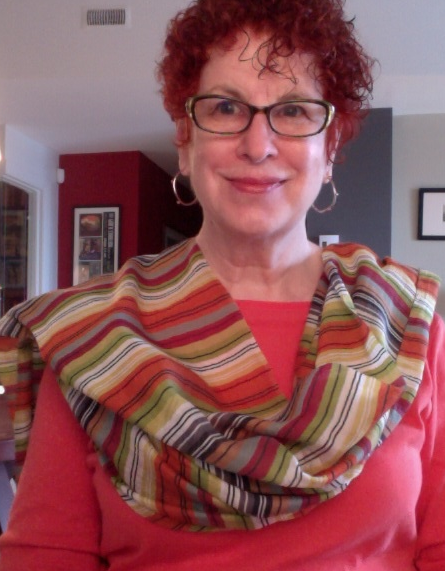 Thank you for the shoutout - I love all the ways you illustrated scarf/shawl wearing, I'm going to have to try some out! 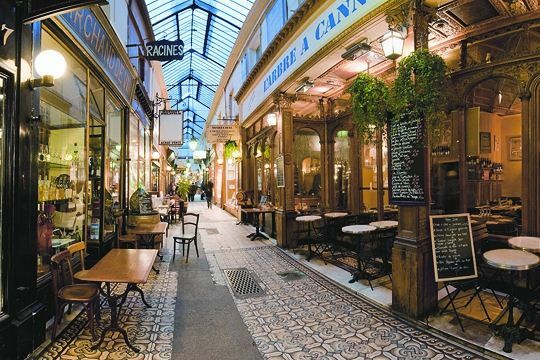 through your blog.I am now a devoted customer of M.Bompard thanks to you! I will miss your blog in the next months. Wishing you a sunny, joyous, summer &many happy returns on your birthday. Very inspirational and stylish post!Scarves are so versatile, and ads some chic addition to an outfit. WoolGold is a leading manufacturer of scarves and shawls in India.